Namasté Solar is not business as usual. We’re an employee-owned B Corp that believes in using our business to create a positive impact in our communities. 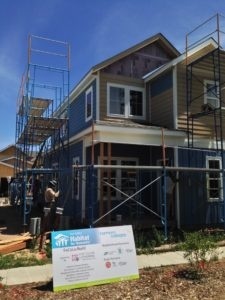 That is why Namasté Solar began a partnership with Habitat for Humanity in 2017 as a solar sponsor for the new Harmony Cottages community in Fort Collins, CO. Namasté Solar will be donating up to $10,000 to the project each year, and our crews will be installing solar on each of the 48 new homes in this community. Solar will help make these homes even more affordable by lowering residents’ utility bills for years to come. 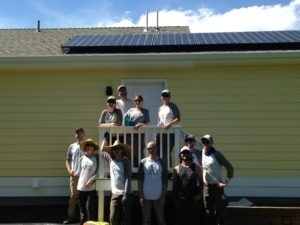 Additionally, Namasté Solar has organized two employee volunteer days at Harmony Cottages so far, logging over 170 volunteer hours. Our volunteers were put to work building a porch, painting the outside of homes, finishing siding work, and completing other projects. 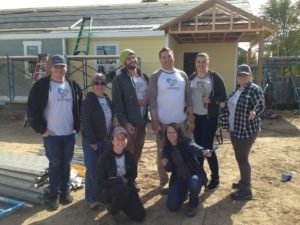 As part of Namasté Solar’s mission to make solar easy and accessible, Namasté Solar is taking it one step further by offering a discount to Habitat for Humanity residents, staff, and volunteers who want to install solar on their homes. Solar is a better way to power our lives, and we want more people to be able to access the cost savings benefits of solar.